A change announced in February in the construction schedule of California's controversial, gargantuan high-speed rail project  one that would connect San Jose to the Central Valley ahead of building the SoCal segment that would connect the Valley to LA  came under fire Monday at the State Assembly's transportation committee meeting. The business plan for the $64 billion project remains a work in progress, and as the SF Business Times reports, that had at least one lawmaker saying he didn't want to see the already expensive rail line "turn into the next Bay Bridge." That came from committee chair Jim Frazier, a Democrat who represents a large part of the Sacramento River Delta, and further criticism and uproar came from Catharine Baker (R-San Ramon), and Adam Gray (D-Merced) due to a communications failure over the fact that the revised plan also delays an originally planned spur that would extend the already under-construction tracks between Fresno and Madera up to Merced  which would ultimately, in Phase 2, be extended all the way to Sacramento. The map below shows the original plan with Phase 1 in dark blue, and the currently under-construction segment in bright green. Here's the proposed change of plan, with the revised Phase 1 now getting the green highlight. 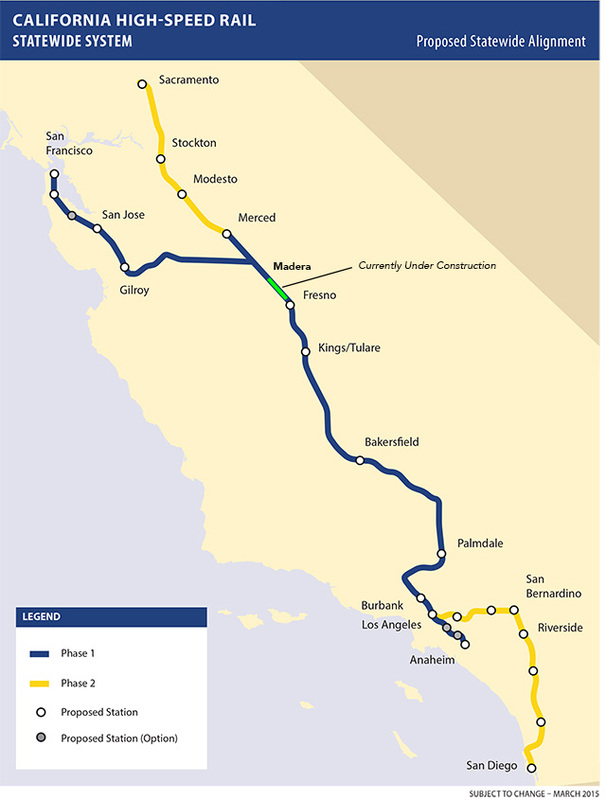 Note the Merced spur gets left out, and the initial plans do not connect to Los Angeles. You can see the full draft 2016 Business Plan here, if you want to dive deep in the wonkiness about funding, etc. Suffice it to say, Southern California has good reason to be a little miffed that trains won't be making it down there until, like, 2029 at this point. As the LA Times reports, Hasan Ikhrata, executive director of the Southern California Assn. 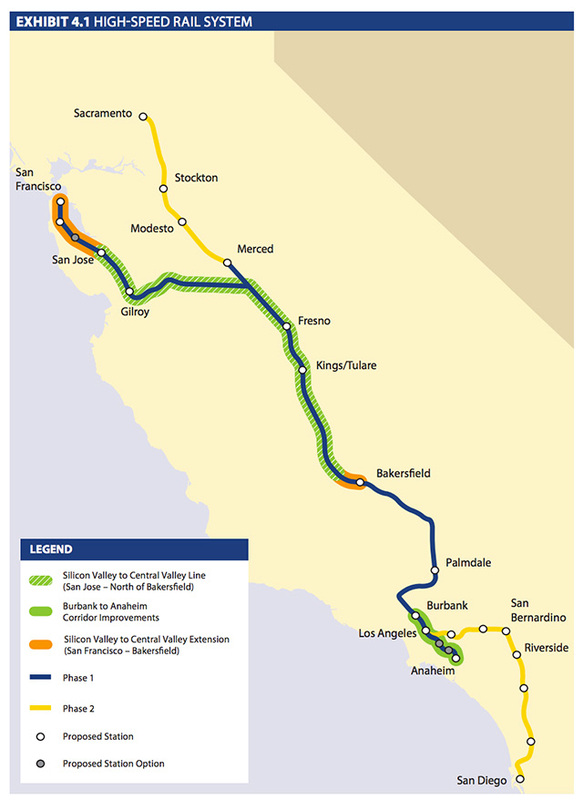 of Governments and a strong supporter of the rail line was calling alarm bells yesterday about the fact that, as of now, there does not appear to be a viable funding plan for the SoCal segment, because all the known funds will have been exhausted now by the time the San Jose-to-Bakersfield segment gets built. "You can’t say you can do something without saying how you are going to pay for it,” he said to the paper. “This is a must. If you don’t have the money in the bank, I understand that. But you can’t assume the money is going to fall from the sky. You have to have a path." The reason for the change of plan, as reported in February, is that the segment between Bakersfield and the Los Angeles basin is far more geologically complex, and will require a series of tunnels to be bored that will inevitably lead to delays and extra expense. The idea is build the cheaper northern section first, with a new injection of federal funds to electrify the Caltrain tracks between San Jose and SF, and allow more time to identify funding for the more expensive southern segment. Right now, the schedule has the first trains between Bakersfield and Fresno running by 2022, and the San Jose to Bakersfield trip possible by 2025. As far as when you'll be able to take a high-speed trip from San Diego to Sacramento, which are part of the very hypothetical Phase 2, let's just say your grandkids can keep that dream alive.